2 Broadcaster Press March 13, 2018 www.broadcasteronline.com A Little Bit Out of It Dave Says By Daris Howard Layoff Onsurance? Keep It In Your Own Pocket! 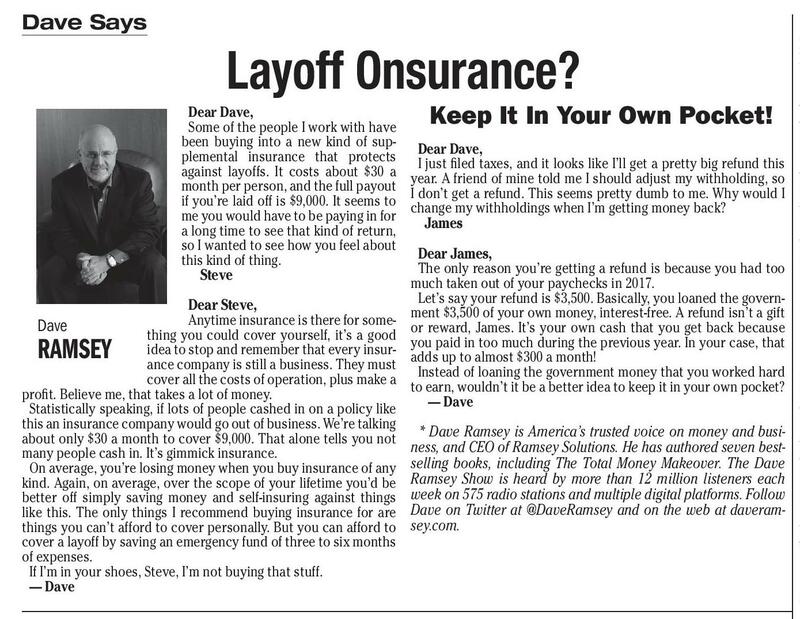 Dear Dave, Some of the people I work with have been buying into a new kind of sup- Dear Dave, plemental insurance that protects I just filed taxes, and it looks like I’ll get a pretty big refund this against layoffs. It costs about $30 a year. A friend of mine told me I should adjust my withholding, so month per person, and the full payout I don’t get a refund. This seems pretty dumb to me. Why would I if you’re laid off is $9,000. It seems to change my withholdings when I’m getting money back? me you would have to be paying in for James a long time to see that kind of return, so I wanted to see how you feel about Dear James, this kind of thing. The only reason you’re getting a refund is because you had too Steve much taken out of your paychecks in 2017. Let’s say your refund is $3,500. Basically, you loaned the governDear Steve, Anytime insurance is there for some- ment $3,500 of your own money, interest-free. A refund isn’t a gift Dave thing you could cover yourself, it’s a good or reward, James. It’s your own cash that you get back because idea to stop and remember that every insur- you paid in too much during the previous year. In your case, that ance company is still a business. They must adds up to almost $300 a month! cover all the costs of operation, plus make a Instead of loaning the government money that you worked hard to earn, wouldn’t it be a better idea to keep it in your own pocket? profit. Believe me, that takes a lot of money. — Dave Statistically speaking, if lots of people cashed in on a policy like this an insurance company would go out of business. We’re talking about only $30 a month to cover $9,000. That alone tells you not * Dave Ramsey is America’s trusted voice on money and business, and CEO of Ramsey Solutions. He has authored seven bestmany people cash in. It’s gimmick insurance. On average, you’re losing money when you buy insurance of any selling books, including The Total Money Makeover. The Dave kind. Again, on average, over the scope of your lifetime you’d be Ramsey Show is heard by more than 12 million listeners each better off simply saving money and self-insuring against things week on 575 radio stations and multiple digital platforms. Follow like this. The only things I recommend buying insurance for are Dave on Twitter at @DaveRamsey and on the web at daveramthings you can’t afford to cover personally. But you can afford to sey.com. cover a layoff by saving an emergency fund of three to six months of expenses. If I’m in your shoes, Steve, I’m not buying that stuff. — Dave RAMSEY Wellness Summit For South Dakota Teens BROOKINGS, S.D. 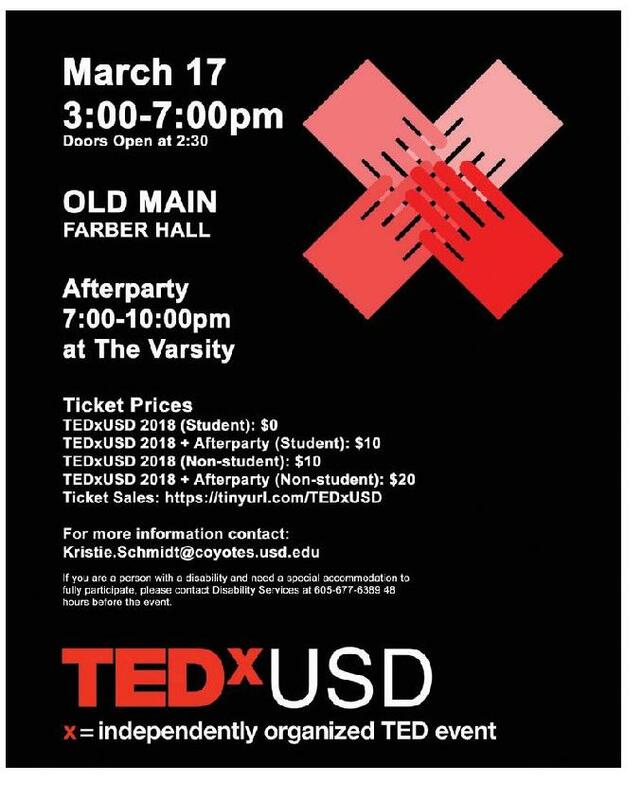 - SDSU encourage healthy living Extension, in collaboration through the seven dimenwith the SDSU Wellness sions of wellness in their Center and Walmart Founschools and community. dation, will host a two-day During the summit, Health and Wellness Sumteens will develop an mit for South Dakota teens understanding of the folinterested in serving as lowing: Health & Wellness AmbasThe seven dimensions sadors April 5 - 6, 2018 in of wellness Brookings at the Days Inn • Learn and promote (2500 6th St). healthy living choices and "This summit empowlifestyles ers teens by providing • Create conversations, them with training and media, programming and information on wellness community engagement Br living around all dimensions of and overall healthyoa d wellness so they are then ready to ca steronline.co m provide leadership and • Specific health and wellrole-modeling on healthy ness curricula living to peers and memThe Summit will include bers of their community," a variety of breakout said Nikki Prosch, SDSU sessions and interactive Extension Health & Physiactivities focused on the cal Activity Field Specialtopics of wellness includist. ing: What is a Health & Well• Nutrition ness Teen Ambassador? • Sleep Health & Wellness • Financial health Teen Ambassadors will be • Physical activity trained to promote and • Environmental health • Social health Following the summit, participating teens are asked to complete six hours of programming. 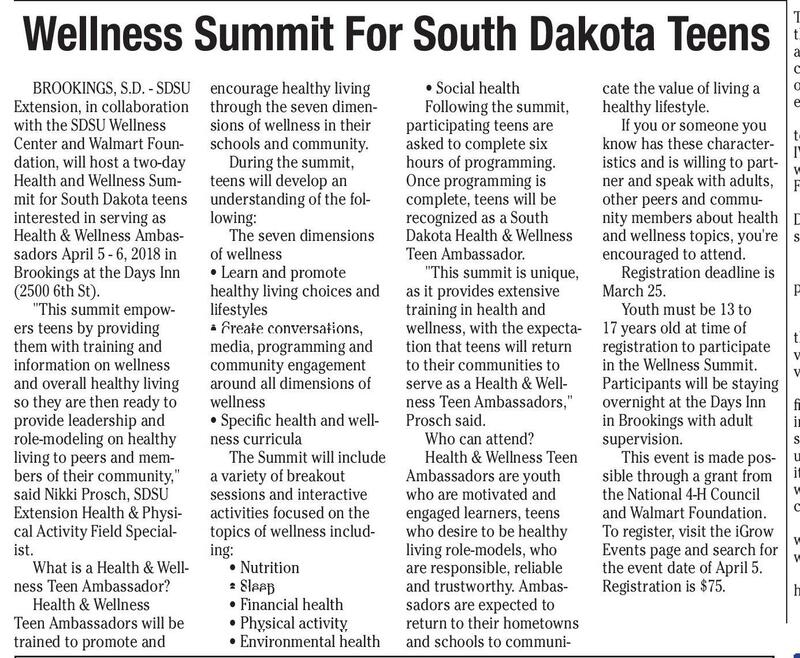 Once programming is complete, teens will be recognized as a South Dakota Health & Wellness Teen Ambassador. "This summit is unique, as it provides extensive training in health and wellness, with the expectation that teens will return to their communities to serve as a Health & Well2x1 ness Teen Ambassadors," Prosch said. 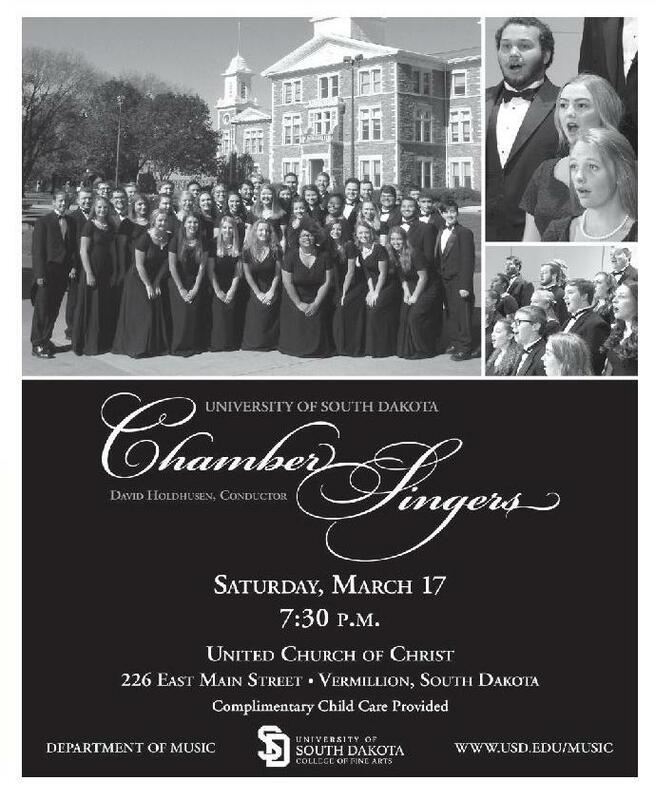 Who can attend? Health & Wellness Teen Ambassadors are youth who are motivated and engaged learners, teens who desire to be healthy living role-models, who are responsible, reliable and trustworthy. Ambassadors are expected to return to their hometowns and schools to communi- Broadcasteronline.c om cate the value of living a healthy lifestyle. If you or someone you know has these characteristics and is willing to partner and speak with adults, other peers and community members about health and wellness topics, you're encouraged to attend. Registration deadline is March 25. Youth must be 13 to 17 years old at time of registration to participate in the Wellness Summit. Participants will be staying overnight at the Days Inn in Brookings with adult supervision. This event is made possible through a grant from the National 4-H Council and Walmart Foundation. To register, visit the iGrow 3x1 Events page and search for the event date of April 5. Registration is $75. Broadcasteronline.c om Dora and Frank were some older neighbors that I often visited. They lived in a little trailer house. In the winter, I would haul wood from their shed and stack it by their door to make it more convenient for them to keep their house warm. One winter day when I arrived, they weren’t home. That was a little bit unusual because they seldom went anywhere in the winter. But I didn’t think too much about it. I figured they must have gone to the store or something. I set to work refilling their wood supply. I also shoveled their walk and chipped off the ice. Just as I was finishing and preparing to leave, another neighbor stopped to visit with me. “You’ve heard that Dora’s in the hospital, haven’t you?” he asked. “No,” I replied. “What’s the problem?” “She had an allergic reaction to something,” he said. I decided I would pay Dora and Frank a visit at the hospital, but I was too dirty and sweaty to go directly there. I hurried home and showered and changed. I then drove to the hospital. When I arrived, I checked in at the front desk, and they told me where Dora was. I went to her room and knocked on the open door. Frank, a man of few words, beckoned to me to come in. Dora greeted me, and we visited briefly before the doctor came in. He told Frank the hospital needed to run some more tests, and Frank nodded. But when the doctor started to visit with Dora, she appeared frightened. “Dora,” the doctor said, “it’s time to take you upstairs.” Suddenly, Dora started to yell. “No! No! I don’t want to go!” She tried to get up, almost ripping the I.V. from her arm. The doctor stopped her, but not without great effort. He hit the nurse-call button to get additional help. A nurse appeared and joined in the fray, but Nora was fighting like a lion. They called for more help. Frank and I moved out of the way as another nurse and an orderly came in. It took all of them great effort to keep Dora from escaping. The doctor asked Frank if they could give Dora a sedative to calm her, and Frank nodded. With a quick shot into her IV, Dora finally settled down and was soon asleep. That was when they took her for some more tests. I said goodbye to Frank as he headed to the elevator with them. The next day, after work, I went to the hospital to see how Dora was doing. Frank nodded a hello as I came in. Dora was sitting up eating her dinner. “So how are you doing today?” I asked her. Dora shoved her food to the side. “I think I need to explain about yesterday,” she said. “Only if you want to,” I replied. “The thing is,” she said, “when you came, I was still a little out of it from my allergic reaction. And when you come to visit us, it’s almost always in our home. So, as we sat there visiting, I somehow got the idea I was at home. “Then, as we visited, the doctor came in, and I couldn’t figure out who he was or why he was in my home dressed in white. But then when he said he was going to take me upstairs, my mind reminded me that our trailer didn’t have an upstairs. And as I sat there staring at him, in his white robe, it came to my mind that the upstairs he was talking about was heaven. I was sure he was the angel of death, and he had come for me.” I laughed. “Dora, as hard as you fought, the angel of death would have had his hands full taking you. It’s too bad you weren’t entered in Olympic wrestling.” Frank smiled and said some of the few words I’d ever heard him say. He said, “She could have won the gold.” OPEN HOUSE Saturday, March 24, 2018 • 10AM-12PM Save $30 on a Summer AC Tune-Up! 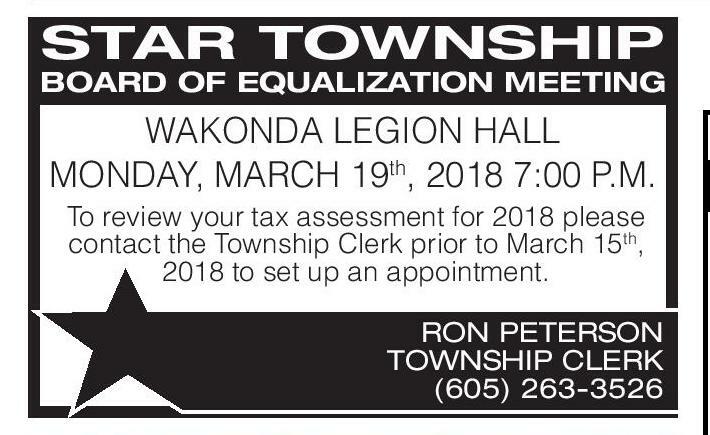 4x1 STAR TOWNSHIP BOARD OF EQUALIZATION MEETING Just give us a call and we’ll WAKONDA LEGION HALL send out a qualified VERMILLION TOWNSHIP th MONDAY, MARCH 19 , 2018 7:00 P.M. EQUALIZATION MEETING Service Technician like To review your tax assessment for 2018 please contact the Township Clerk prior to March 15th, Monday, Tyler, to make sure your 2018 to set up an appointment. 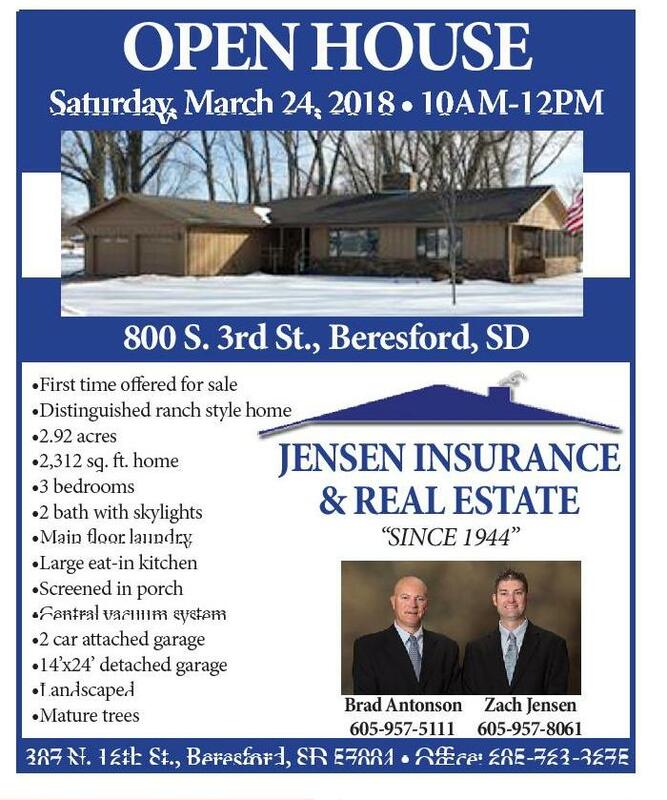 800 S. 3rd St., Beresford, SD March 19 , 2018 7:00 PM th JENSEN INSURANCE & REAL ESTATE AC unit is ready for those RON PETERSONsummer South Clay County 4-H Center hot Dakota TOWNSHIP CLERK 515 High Street, Tyler Reiser Vermillion days (605) 263-3526 and save $30! * Service Technician A written request to Appeal must be delivered to the 13 years experience Township Clerk by Thursday, March 15th, 2018. Request must include parcel number. Jackie Williams, Clerk 31536 Princeton Ave. Vermillion, SD 57069 605-202-9179 •First time offered for sale •Distinguished ranch style home •2.92 acres •2,312 sq. ft. home •3 bedrooms •2 bath with skylights •Main floor laundry •Large eat-in kitchen •Screened in porch •Central vacuum system •2 car attached garage •14’x24’ detached garage •Landscaped •Mature trees When You Want Comfort...You Want Kalins When You Want Comfort… You Want Kalins! 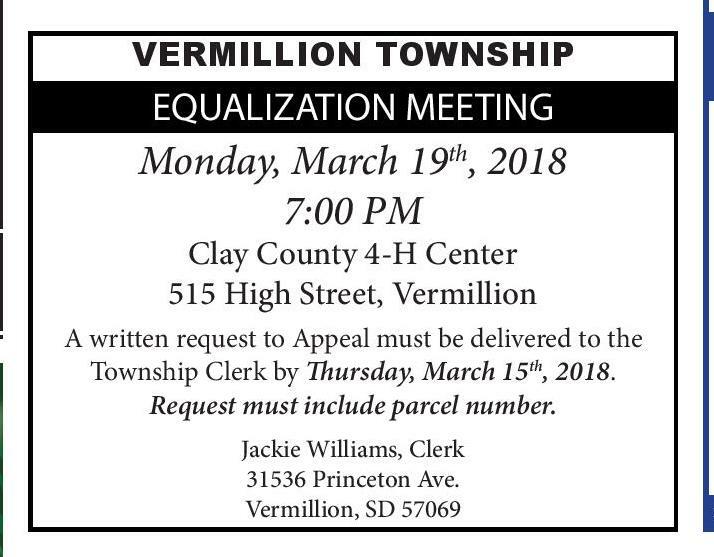 Vermillion: 605-624-5618 Call for full details. & Operated “Large or small, we do it all” 69 years as a Premier Lennox® Dealer 96 years in the Business 400 years of Heating and Cooling Experience = Your #1 Choice in Vermillion! 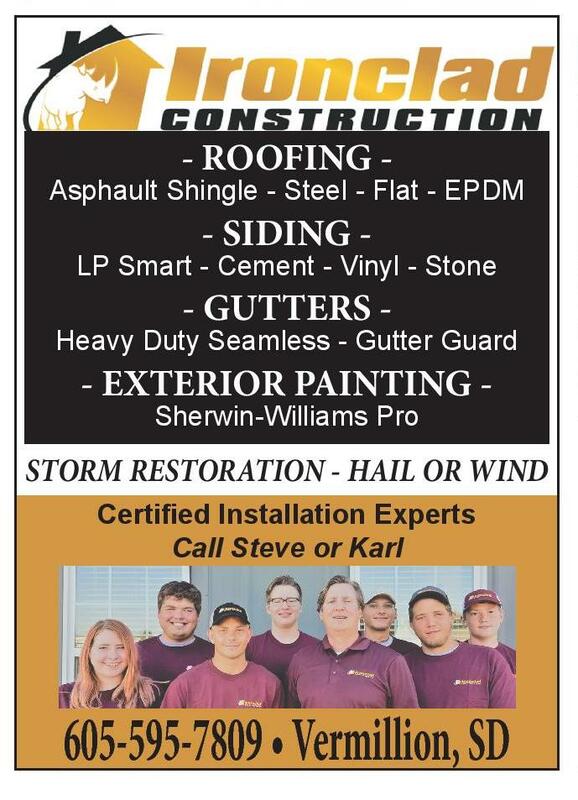 Yankton Vermillion Sioux City 605.665.4348 605.624.5618 712.252.2000 kalinsindoor.com - ROOFING - Asphault Shingle - Steel - Flat - EPDM - SIDING - LP Smart - Cement - Vinyl - Stone - GUTTERS - Heavy Duty Seamless - Gutter Guard - EXTERIOR PAINTING Sherwin-Williams Pro STORM RESTORATION - HAIL OR WIND Certified Installation Experts Call Steve or Karl 605-595-7809 • Vermillion, SD Brad Antonson Zach Jensen 605-957-5111 605-957-8061 307 N. 16th St., Beresford, SD 57004 • Office: 605-763-2675 *Rebate offer only available to Vermillion Light & Power customers. 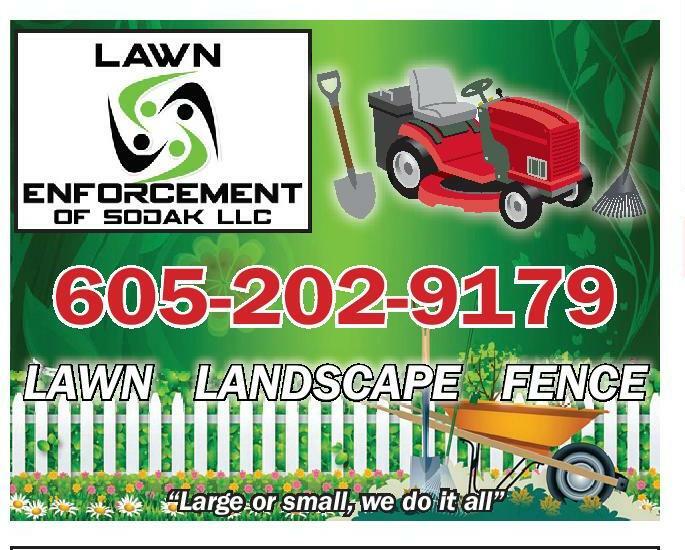 LAWN LANDSCAPE FENCE “SINCE 1944” Tell them you saw it in the Broadcaster!